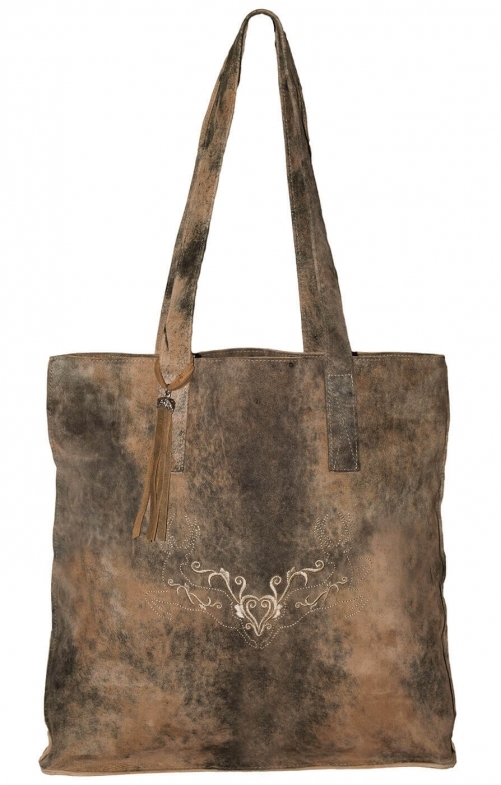 Charming traditional tote bag in weathered brown suede. This spacious and practical traditional Dirndl bag is perfect for storing those lovely Oktoberfest souvenirs. Shop to your heart’s content as you display the intricate heart-shaped floral embroidery on this tote bag, flanked by two leaping deer etched in traditional style. Featuring a large zipped pocket and two smaller patch pockets designed to keep your wallet, phone and trinkets within easy reach, the look of this lovely and practical tote bag is rounded off with a detachable tassel charm.